Gingerbread is small pastries made from honey dough with gingerbread spices. 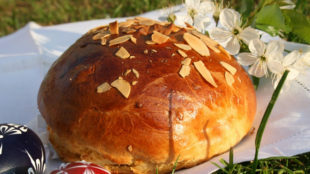 In the Czech Republic it is the traditional Christmas and Easter pastries. It can be carved into various shapes, typical are hearts. After baking, they are decorating with glaze from egg whites. They can be paste into various shapes, the most common is the gingerbread house inspired by Czech fairytale About a gingerbread house. In the Czech Republic, the synonymous of gingerbread is town of Pardubice in eastern Bohemia. Local manufacture of gingerbread dates back to the 15th century. Butter, sugar, vanilla sugar, honey, eggs and baking soda put into a smaller pot, which put in a hot water bath, stir until all ingredients unite, then let the mixture cool slightly. Sprinkle flour and gingerbread spices, knead smooth dough. On a floured surface make a thin sheet from the prepared dough. Make various shapes using Christmas carve moulds, place them on a greased baking sheet or on a baking paper. Bake for 10-15 minutes in an oven preheated to 170 ° C until gingerbread becomes pinkish. Smear baked gingerbread with the beaten egg yolks and leave to cool completely.